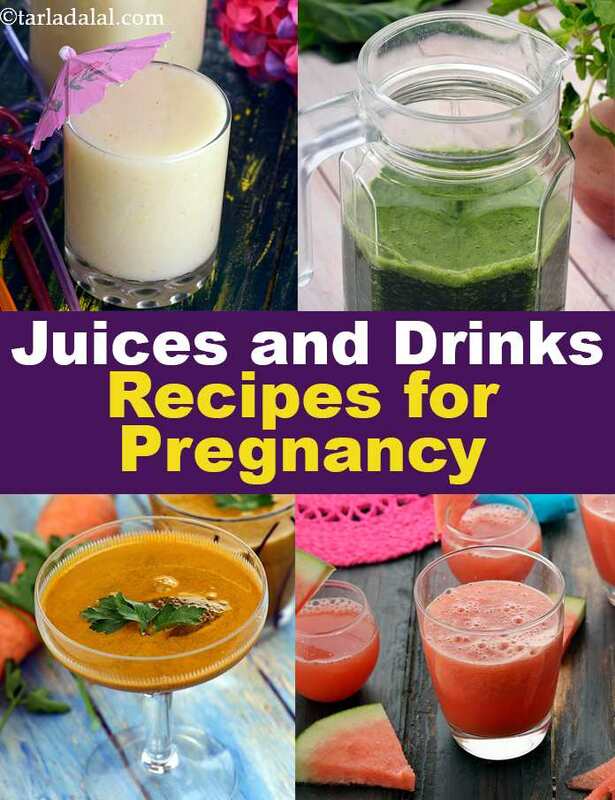 At least 2 litres of water along with a good dose of other fluid consumption is always recommended by all doctors and dietitians to pregnant women. Mums-to-be need to sip of fluids in between meals to keep themselves hydrated and avoid constipation too. Dehydration, especially in the last trimester can cause dizziness, headaches, cramps etc. Water also carries other nutrients to cells of the body and helps to flush out toxins from the body. So now that you have known enough reasons to consume water and liquids, try your hand on our well researched recipes. All you need to remember is to include a variety of fruits and veggies to make your healthy glass of nutrients and avoid the use of sugar or restrict to minimal when required. You are sure to make up for your antioxidant requirement to by way of these juices and drinks. Strawberry Chickoo Shake is an unusual combination of strawberries and chickoo and is just what you will need when you are too famished to cook, too nauseated to eat, but badly in need of a sumptuous snack. Full of nutrients like protein, calcium, vitamin C and fibre too, this is as satiating as a snack can get. Tangy Twist is comprised of healthy fruits like orange, pomegranate and black grapes which combine to give it a lovely purple colour that is soothing to your eyes and this drink is as appeasing to your palate. Top up your Vitamin A levels with this Melon Magic which is also rich in other nutrients like b-complex vitamins, calcium, iron, magnesium, phosphorus and potassium. With no added sugar this drink is naturally sweet because of sweet muskmelons. Kickstart your day with this Carrot Apple and beetroot Juice that is loaded with fibre, vitamin A, vitamin C and phosphorus. The unusual combination of carrot, apple and beetroot gives it a mesmerizing taste and an amazing colour. Here is a cool and healthy cleanser Spinach and Mint Juice to start your day with. The lemon in this dark green juice helps to retain the colour and enhance the absorption of iron in your body. Beet Treat is a mesmerizing drink which satisfies aesthetic as well as nutritional demands. It is high in carbohydrates as it contains beetroot, which is the richest source of natural sugars. Apples give this juice good body thus making sure it satiates your appetite. Veggie Boost has refreshing vegetables like carrot, spinach, parsley, celery which combine to make this super juice rich in fibre and Vitamin C.
Enjoy all our juices and drinks recipes for pregnancy. Explore more varieties in our pregnancy section everyday.